All matches have been made following the Evolution 22 announcement that the main event matchup of Nathan Carnage “Corbett” Versus Spain’s Frankie Munoz. Corbett rose to fame by a steady conquest of virtually any competition there was to be offered in the cruiserweight division in Muay Thai. Though there had been some overtures about Corbett joining the ranks of K-1 and a fairly anticlimactic bout with the Netherlands’ Tyrone Spong, Corbett has now returned to Muay Thai and scored a title off of the Ukriane’s Zhuralyev. Frankie Munoz will represent Corbett’s opponent in Corbett’s return to the Evolution promotion. Munoz is trained by the famed Chakuriki gym home to K-1 standouts: Peter Aerts and now Jerome LeBanner. 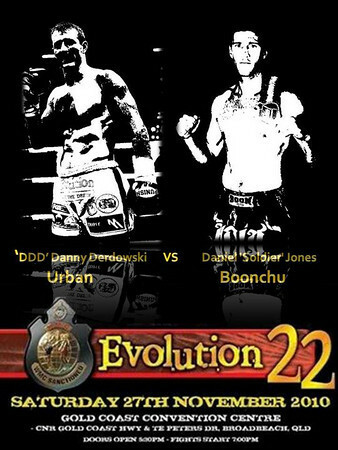 Returning triumphantly to Evolution 22 after a win over Queensland’s John Wayne Parr is Bruce MacFie. Though there was some controversy over the win MacFie will return to Evolution with much to prove after such a notable win. 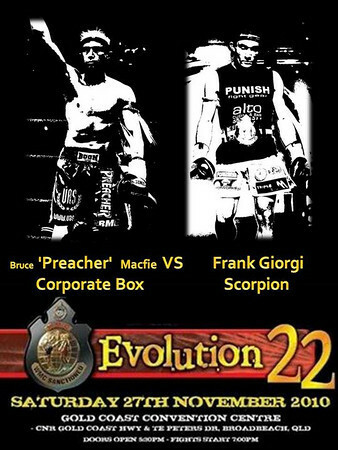 Bruce “Preacher” MacFie Vs. Frankie Giorgi. ~ by fatsoking on November 23, 2010. You’r truly right with this blog! !